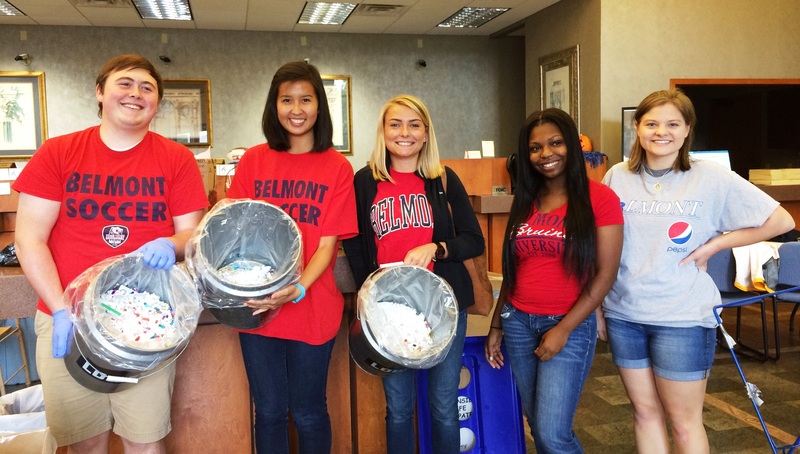 On September 26, five Belmont undergraduate students and Professor of Chemistry Dr. Kimberlee Daus participated in the Dickson County Drug Take Back, held on National Prescription Drug Take Back Day. Coordinated by Vanderbilt University and the Dickson Police Department, the team worked alongside faculty and students from Vanderbilt, Lipscomb and Belmont pharmaceutical studies to catalog and count more than 50 pounds of medication. Students participating included Mack Ogle, Teaghan Chen, Mackenzie Watson, Unique Ellis and Allison Lane. The National Drug Take-Back Day, set by the Drug Enforcement Agency, provides a service to the community through safe and responsible disposal of unused medication. Additionally, these events help to educate the public about the potential drug abuse associated with these medications.